Weddings are meant to be magical. It’s the day we look forward to most of our lives. Most people dream of finding their soul mate and having the most romantic ‘big day’ ever! With that being said, your big day doesn’t need to be ‘big’ or extravagant. While many feel pressured about having a traditional wedding with hundreds of guests, many couples go away to celebrate their love and the beginning of their life together. Destination weddings are a great way to celebrate your love. You’re in a stunning place with your partner and the closest people to you. You’ve probably heard many celebrities having “intimate” ceremonies. Many people believe they lose sight of what matters when there are too many people at their wedding. Weddings in Maui are super romantic. The tropical sunset, sandy beach, blue waters, and ocean breeze make the best setting for a wedding ceremony. Wedding planners make the whole preparation period much easier on the couple. They’re experts in their field and know what they’re doing. Wedding planners are great at their jobs. With their vast experience, they immediately understand what a client is looking for in a wedding. Most couples having destination weddings want every aspect of their big day to reflect their relationship. Deciding a venue for your wedding ceremony is a big responsibility for your big day. These are memories you are making for a lifetime! You want them to be as perfect as possible. Lucky for you Maui is as picturesque as it gets. There are many spots to have an intimate wedding in Maui. Makena Cove is one such place. Once you step into the cove through the opening in the rock wall, you will know why it’s so sought-after. The cove is known for its unique black lava rocks with the inlets of water. 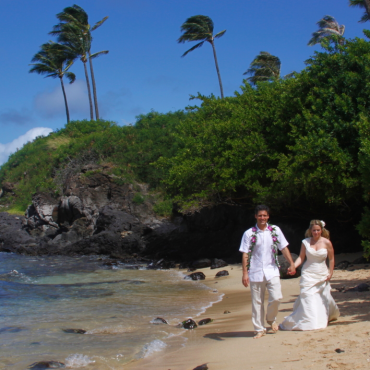 Maui is also dotted with many beautiful private locations that would be perfect for a ceremony. A wedding planner in Maui could help you out with such locations too, they have the best insight! Kapalua Bay on the west side shore of Maui is known for its serene blue waters. The area is a perfect place to make such memories. The name of the bay comes from the lava rocks that cradle the bay; Kapalua means arms embracing the sea. Couples feel pressured into spending an exorbitant amount on their wedding. While many don’t have that kind of money, others feel that spending so much money on the first day of their life together is irrational. 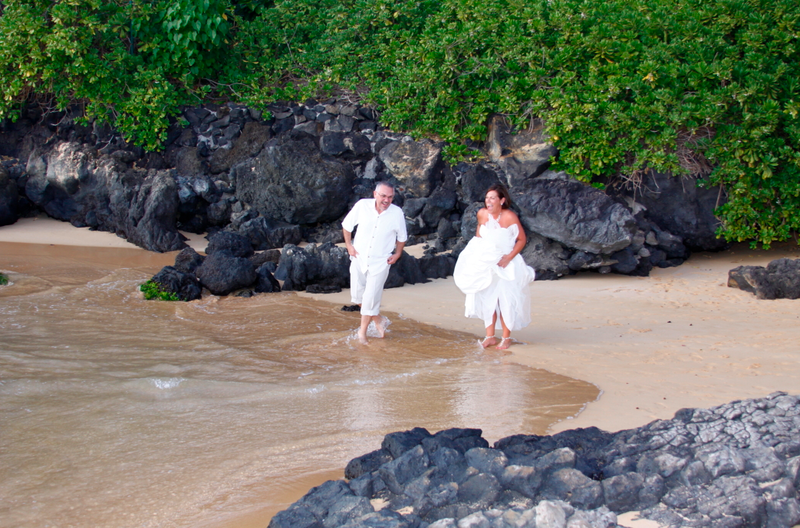 Weddings in Maui are possible at any price range. For those looking to spend as little as possible, an elopement is ideal. 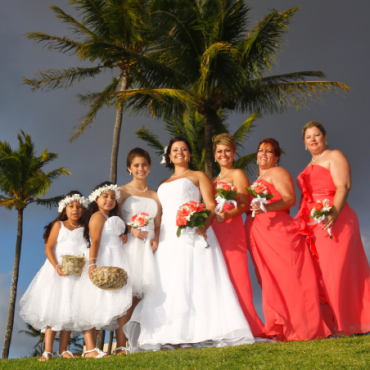 Wedding packages in Maui range from $485 to $3200 depending on the frills you want. Every girl looks forward to go wedding dress shopping. Everyone has an idea of what their dress would look like. The wedding dress you choose should reflect your personality and style. Many brides want to “look like themselves” and so choosing an overly flamboyant dress when that isn’t their go-to, will look strange. Weddings in Maui are very tropical inspired and boho-chic. Brides usually opt for slim silhouettes and dresses that aren’t too big or long. Having an easy going dress makes it easy for them to move around, especially for a beach wedding. If you’re having bridesmaids at the ceremony, opt for shorter cuts and flowy silhouettes. Keeping in mind the resort vibe of Maui, pastels tie in well for the ceremony. Pastel pinks, blues, yellows, lavender, and peach are great go-tos. Strapless dresses are commonly picked out for beach/resort style weddings. We haven’t forgotten about the men! 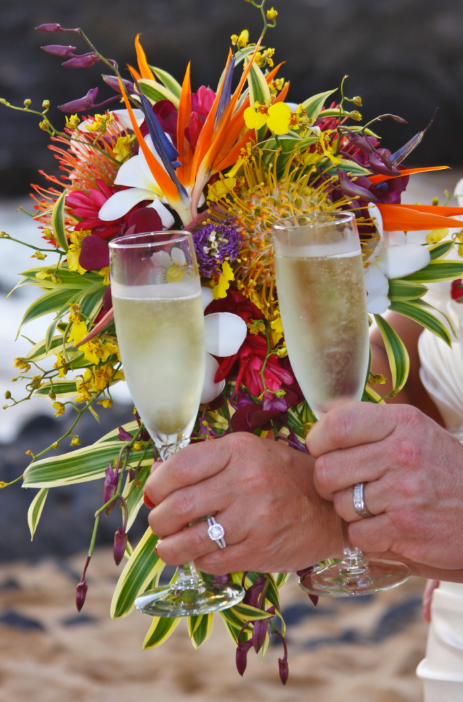 Guys have a few more options to choose from when it comes to having a wedding in Maui. Instead of the traditional tuxedos, the groom can choose to wear a shirt and pants. Stick with the pastel theme though. Grey pants and pastel shirts are a safe path to go. Add a grey vest and tie to the look if you want to dress it up some more. Some grooms also opt for the more traditional beach wear like a Hawaiian shirt! Those looking to take fashion forward risks could invest in some white pants too! Keep tabs on airline prices a few months in advance. Monitor them regularly and inform your guests if there’s any drop in prices. Encourage them to RSVP as early as possible so that they can take advantage of the early bird fares. A picture speaks a thousand words! Forever capture those moments filled with love with your partner on your wedding day. Every couple wants spectacular photographs of their big day! Make sure you choose a wedding photographer who can bring out the best in the moment. Choose a photographer who can capture the essence of your relationship through pictures. Since you’re having your wedding away from home, you want to invest in an experienced videographer! You need some good quality videos, perfectly edited, to take home to your family! Maltese Dreams is here to take control of your wedding planning. Our experienced wedding planners will make your wedding day the most memorable of your lives! Have a look at the packages we have to offer, as well as the weddings we have previously done. Contact us at 808-264-3151.